This Wine Is SO Last Century! The Rib and I bought this bottle back in February on the recommendation of one of the helpful lads at our favorite local wine shop. We originally intended to open this bottle while celebrating our anniversary on Valentine’s Day (I’ll pause a second or two for the “awes” from the ladies and sensitive men). For whatever reason, we didn’t end up opening this wine until a few weeks ago. It was 1) worth the wait, and 2) an excellent recommendation. I popped the cork on the Domaine Borgeot (a Pinot Noir) and decanted it for an hour before dinner (after stealing a quick sip). On the nose, I got a little wet earth, wet (but clean) leather, and a touch of mushroom. There were also some cherry notes and a bit of licorice. There was a tart cherry on the palate. The licorice notes I got on the nose came through nicely and were accentuated by a faint white pepper. There was a bit of earthiness in there, too, but it wasn’t terribly overpowering. The tannins were silky and delicate, yet grippy. A sip or two in, the Domaine Borgeot’s finish put me in mind of cherry tobacco and was reminiscent of a mild cigar. An hour and a half in, cocoa began to emerge on the palate and the cherry notes rounded out nicely (not that the fruit was particularly sharp to begin with). We paired the Domaine Borgeot with grilled salmon with pesto, a wild rice blend, and steamed broccoli (special shout-out to “C-Squared” for the pesto!). To say that this pairing was perfect might be an understatement. I will admit two things here, though: 1) Salmon is not my go-to fish choice; and 2) Gordon Ramsay might have accused me of leaving the salmon on the grill 75 to 90 seconds too long (it wasn’t overdone per say, but could have used a touch less heat). Everything about this experience was great: the wine, the food, and the company (which was comprised solely of The Rib). Given the tobacco notes in the wine, we decided to fire up a mild-to-medium cigar. The pairing was O.K., but not great. The smoking didn’t ruin the wine, but neither element enhanced the other by much, either. 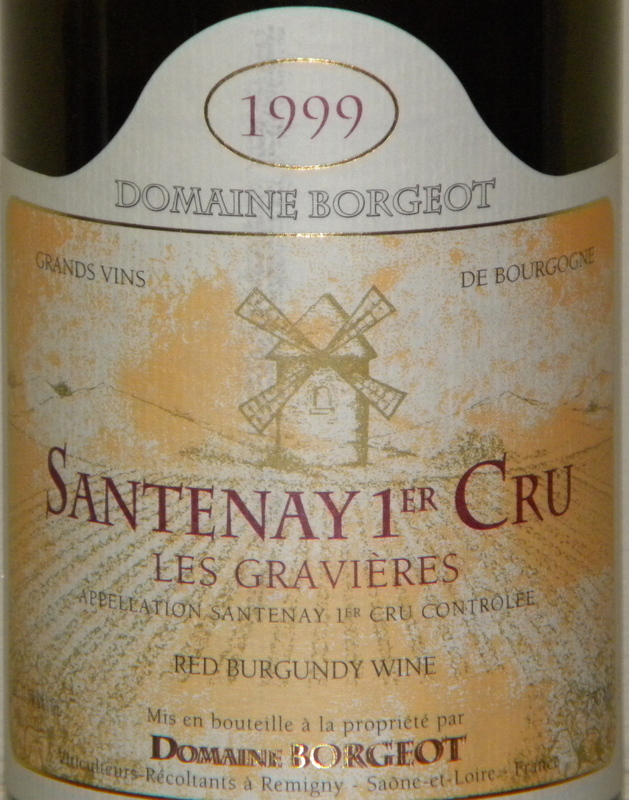 The 1999 Domaine Borgeot is not the easiest wine to find, but can be had for $30-35 per bottle. This is a steal. Various notes on this wine give it a drinking window through 2015. I would be curious to see how this wine developed over the next couple of years (not that the other two bottles we have will last that long), but it’s ready to drink now. If you can get your hands on a bottle of this one, do it!